Yes, the Eagles have their fourth and final preseason game Thursday night, and of course that is where our focus is. However, tonight also kicks off the start of the college football season, with a number of games airing both tonight and Friday night, before a full slate of games on Saturday. Since the NFL Draft has been a year-round fascination, we'll be previewing five college prospects every week who may make sense for the Eagles. To kick off the college season, this week we'll preview 10 -- five today for the Thursday and Friday games, and five more on Saturday. As long as you're taking in some college games, you may as well keep your eye on a few players who may be future Eagles. Zach Cunningham, LB, Vanderbilt (6'3, 230): South Carolina at Vanderbilt, Thursday, 8:00 p.m.
Cunningham is a highly athletic LB who arrived at Vanderbilt looking more like a wide receiver. He put on weight, and has become the clear-cut best player on the team. A season ago, Cunningham filled up the stat sheet, leading the Commodores with 103 tackles, 16.5 tackles for loss, 4.5 sacks, and 4 forced fumbles. The Eagles have an obvious need for linebacker depth, and Cunningham would be a great fit in 4-3 scheme at the WILL spot, where he could be a cheaper alternative to Mychal Kendricks. Mitch Leidner, QB, Minnesota (6’3, 230): Oregon State at Minnesota, Thursday, 9:00 p.m. Wait... The Eagles signed Sam Bradford to a two-year deal worth $36 million, and then Chase Daniel to a three year deal worth $21 million, and then traded a bundle of picks to move up to the No. 2 pick in the 2016 NFL Draft to select Carson Wentz... And they're going to draft another quarterback?!? As Bradford himself acknowledged, his time as the "the guy" in Philly is short after the Eagles nabbed Wentz. His cap number is $22,500,000 in 2017, $13,000,000 of which the Eagles will save if he is released, $17,000,000 if he is traded. On the financial end alone, it is extremely unlikely Bradford will be on the team in 2017. That would leave the Eagles with two quarterbacks, and roughly half the NFL only carries two quarterbacks. However, Eagles owner Jeffrey Lurie clearly stated that the Birds are looking to draft a quarterback in most years going forward. One quarterback who may make sense in the later rounds is Minnesota's Mitch Leidner, who is similar to Wentz in many ways. He's a bigger-bodied guy at 230 pounds, although not quite as tall as Wentz. He is also the unquestioned leader of the Gophers' offense, he has good (although not great) arm strength, he has the ability to take off and run, and he's known as a good student. In those respects, he compares to Wentz. On the downside (and these concerns are very significant, obviously) Leidner is an inaccurate passer, his throws often wobble, and his long delivery needs a lot of work. However, as a late-round developmental quarterback, there are a lot of professional-worthy traits that will be appealing to NFL teams. It might make sense for the Eagles to add a quarterback with a similar skill set as Wentz, so that they wouldn't have change much of what they do offensively should Leidner ever need to enter a game down the road in relief of him. Jonah Persig, OT, Minnesota (6'8, 325): Oregon State at Minnesota, Thursday, 9:00 p.m.
Persig is a big, tall offensive tackle with similar measurements as 2016 Eagles fifth round draft pick Halapoulivaati Vaitai. He's a good pass protector, as he does a good job keeping himself in between his man and the quarterback. In the run game, however, Persig doesn't offer much in the way of a guy who is going to move defenders off the line of scrimmage. As a later round pick, he could provide the Eagles with more offensive line depth on the edges. Sean Harlow, OG, Oregon State (6’4, 310): Oregon State at Minnesota, Thursday, 9:00 p.m. In the 2016 NFL Draft, the Eagles selected versatile offensive lineman Isaac Seumalo out of Oregon State in the third round. In the 2017 draft, they could have interest in another versatile Oregon State offensive lineman in Harlow. In his freshman season in 2013, Harlow started nine games at RT. In 2014, he started the first five games at RT and the final seven at LT. In 2015, he started all seven games he played at LT before being lost for the season with an ankle injury. Throughout his career at Oregon State, Harlow has practiced at all five positions along the offensive line, and probably projects to guard or center at the next level. He is the son of former New England Patriots and Oakland Raiders offensive tackle Pat Harlow, who was selected 11th overall in the 1991 NFL Draft. Back in January at the Senior Bowl, Doug Pederson noted what he prioritizes in his offensive linemen. "You love offensive linemen that are versatile," explained Pederson. "You love to have tackles that can play left or right. You love to have guards that can also play center. The more you can have that flexibility with your guys up front, the more combinations and rotations you can have, because not everyone is going to stay healthy for 16 games and you have to mix and match that. Guys that are athletic who can get out on the perimeter and run, aggressive up front, have a little, as they say, 'piss and vinegar' in their neck are guys that you look for." That look like piss and vinegar to you? 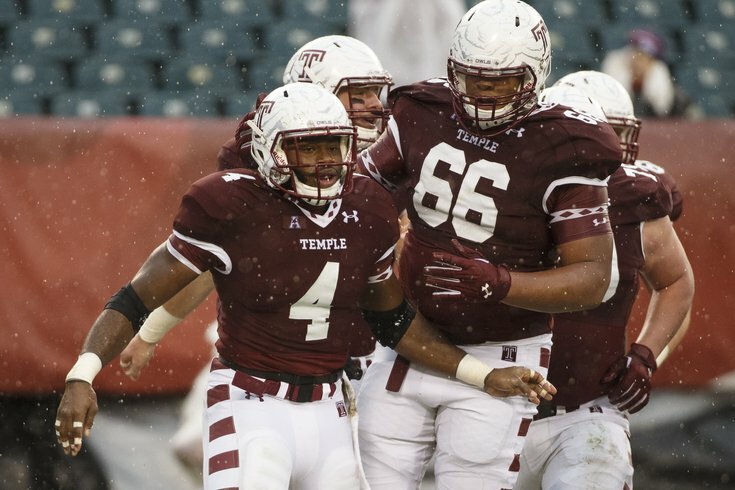 Dion Dawkins, OT, Temple (6’5, 320): Army at Temple, Friday, 7:00 p.m.
Dawkins was arrested for aggravated assault, simple assault, recklessly endangering another person and conspiracy in a January 2015 incident at a Philly nightclub that left another student with a broken orbital bone. Most of those charges were later dismissed, then reinstated before Dawkins finally avoided a trial and agreed to be placed in a diversionary program, Accelerated Rehabilitative Disposition (ARD), according to Marc Narducci of the Philadelphia Inquirer. Certainly, NFL teams will be doing their due diligence on Dawkins when he applies for the NFL draft. In the 2016 NFL Draft, the Eagles showed a willingness to select players with previous incidents, including Wendell Smallwood, Jalen Mills, and Alex McCalister. They also recently traded for Dorial Green-Beckham. As a player, Dawkins is very aggressive in the run game, winning at the point of attack and playing through the whistle. However, that aggressiveness can sometimes work against him in pass protection, where he'll sometimes lunge at opposing defensive linemen, who will occasionally side-step him, getting a free run to the quarterback. NFL teams may decide that Dawkins is a better pro prospect at guard.